At the other end of the scale, the smallest aerotropolis developments cover a few hectares, but still raise concerns of loss of ecosystems and preferential treatment for firms, such as tax breaks. The Update covers just a fraction of what is happening worldwide. Material is already being compiled for Issue 3. 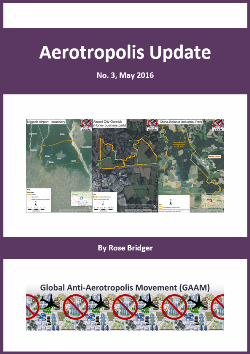 If you missed Issue 1 it is available on the GAAM Aerotropolis Update page.